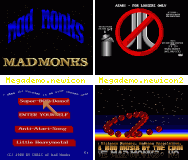 This install applies to "Megademo" © 1989 Mad Monks. Saving the entries in part 2 can be disabled with the CUSTOM1 tooltype. Ennjoy the demo from HD.